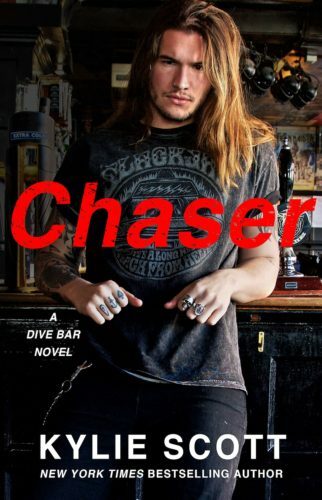 It’s Eric’s turn in Kylie Scott’s third installment in the Dive Bar series. Eric’s womanizing, bad boy reputation comes to a head when he realizes just what everyone thinks of him, and most importantly, when he meets Jean, a pregnant newcomer who catches his interest. He’s caught up in a storm of self-doubt, trying to figure out who he is and who he wants to be. Jean strikes his fancy from the very beginning, but finding out she’s pregnant is a punch to the gut. That’s a no-go for a guy like him, but unlike him, he can’t seem to stay away from her. And once the baby is born, he finds himself a new happy place with her and her baby girl. But Jean and Eric are just friends, and despite feelings deepening every moment they spend together, it’s a much more complicated situation that it seems. He doesn’t want to ruin what they have with taking it further. When an unexpected conversation changes the game, however, they wade into uncharted waters, putting it all on the line. This is a friends-to-lovers story that’s both sweet and refreshing. The narrative has a sort of redemptive quality to it, with Eric finding his way, his happy, where and with whom he least expects. I would have loved to hear Jean’s point-of-view to deepen our understanding of who they were as individuals, and who they are (and hoped to be) together, but overall, with a fast pace and so many sweet moments, it was such a fun book in which to escape.